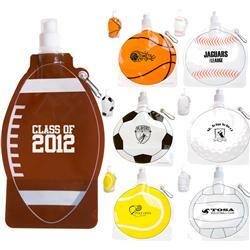 Custom Collapsible Water Bottles - a great sports promotional item and school team builder. Reusable BPA-Free water bottle made of light-weight easy-to-fold, bendable plastic that means bottle can be collapsed flat and easily stored away when empty and stands like any other bottle when full. Made of durable Nylon with PE laminate bottle is freezer friendly. 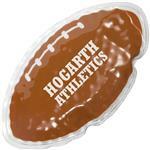 Comes in Football, Baseball, Soccer, Golf Ball, Basketball and Tennis Ball designs. Designed for use with cool liquids only. Not microwave of dishwasher safe. Hand wash only. Includes standard plastic sports cap. Bottles are lightweight and ship flat - great on your wallet and the environment/carbon footprint. Features unique football stock-art on front, clear panel back. Each bottle comes with reinforced grommet with carabiner for easy carry on the go. Carabiner not suggested for use with full bottle! FREE 1-DAY RUSH PRODUCTION AVAVILABLE! 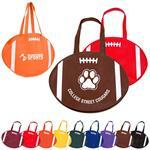 Available Colors: In Football, Basketball, Baseball, Soccer, Volleyball, Golf Ball and Tennis Ball Designs. Production Times Available: 5 working days. 1-DAY RUSH PRODUCTION AVAILABLE. Dimensions: Football - 16 oz. All other ball themes 24 oz. Flat: 7 1/2"W x 9 1/4"H (at widest point - note measurement includes spout); Full: 6"W x 9"H x 3 1/2"D (at widest point) for round ball shape. Typical Imprint Area(s): 3"W x 3"H for football. 4"W x 2 1/4"H for round balls. Available Imprint Options: Screen Print. Inquire for additional color imprints. 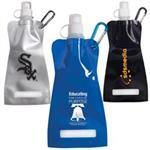 BPA Free, Sports Themed, Collapsible Water Bottles for cold liquids. Inquire - weight varies due to shapes.